When I first started looking into ways to lose weight and improve my overall health, I read a LOT of crazy claims about healthy smoothies. Do Green Smoothies really improve eye sight? I laughed too, I thought that was one of the more extreme claims and I never expected to see any change in my vision. I started wearing glasses when I was ten and my vision has gotten a little worse every year since then. So last week it was about time to get my yearly eye check up. 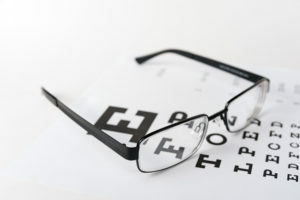 It was still another month away, but my vision was definitely getting more blurry and I could barely read even with reading glasses. So I went in early. It turns out that my vision had improved one whole step, from 7.5 to 6.5 in each eye. I was being over corrected! Once my doctor fitted me with new, weaker, lenses I could see great. Can I say for sure that drinking healthy smoothies caused the improvement in my vision? No. But I can say for sure that 8 months after I first started drinking a green healthy smoothie daily my vision improved for the first time in 45 years.